Attack on Titan: Wings of Freedom, simply referred to as Attack on Titan in Japan, is a third-person action game that has been out in its home country since February. Us Europeans won’t get the anime adaptation game until August 26th, though- meaning most will have to wait a bit longer to get their mitts on the thing. Luckily for MCM London attendees, though, a demo of the game was available to members of the public over the past weekend. I was one such participant, and I’m glad to say that the property has been executed quite well. If you’ve watched or read the excellent anime or manga (or both, if you’re me), you’ll understand that perhaps the main pull of a playable Attack on Titan lies in the realisation of the 3D Manoeuvring Gear. If you haven’t followed the anime, this gear is essentially a harness that soldiers don to fire dual grappling hooks and zoom around vertical environments assisted by gas-powered thrusters. They need this hyper-mobility to outmanoeuvre titans- giant, carnivorous humanoids- to protect humanity’s last walled city. I must admit that I doubted the translatability of the 3D Manoeuvring Gear to games. Spider-Man 2 showed us how to do swinging mechanics back in 2004, but there are several caveats to Attack on Titan’s setting that might’ve hindered the fulfilment of swinging in this game. Firstly, the buildings of Attack on Titan’s walled city aren’t exactly skyscrapers. The majority of the architecture doesn’t exceed three or four stories, meaning there’s less of a vertical buffer in the environment. Furthermore, the speed at which soldiers zip about is much faster than established swinging mechanics have exhibited. The need to accurately swing around and target weak points on titans at such velocity means there’s a slew of challenges to realising this mechanic. The demo that I played was set during a battle to defend a portion of the city of Trost that’s been breached by the titans, in line with early episodes of the anime. The controls were a little bit bizarre to start out with, but I soon got the knack of controlling Eren on the PS4 controller. The X button is, as ever, the jump button. Pressing square launches you in the whichever direction you’re moving, and much like in Spider-Man 2 you’ve got to time your grappling hooks with for maximum speed of traversal through the environment. When you do close in on a titan, it’s time to lock on to them using R1. At this point you can use the right stick to flick between several parts of the titan’s body- knees, elbows, and neck. A press of square in this mode attaches a grappling hook to the highlighted area, allowing you to circle around the anchor point for a short time. Pulling the L2 trigger at this moment causes the grappling hook to reel in, and a well-timed push of the triangle button launches Eren into a spinning sword slash to sever the appropriate area. Much like in the anime, titans are a varied bunch. This means you’ll have to tackle individuals differently: more docile specimens can be dispatched quickly and easily by going straight for the kill-spot at the back of the neck, but more alert creatures won’t go down so easily. One might track your movements with their face, meaning you need to sever a leg to trip them up without risking the chomp. Some are unusually grabby, and require an amputation at the elbow before you’re able to zero in on their neck. I must say that I’m very impressed at the execution of these mechanics. Rocket-powered swinging could’ve easily devolved to a nightmare train wreck of uncontrollable fumbling, or slowed down to the point of losing that characteristic dynamism. As it is, the system deftly juggles speed and precision to really capture the essence of the show’s fight scenes. It remains to be seen whether the game’s length is supported by varied and interesting scenarios to facilitate this action, but colour me very interested for now. What’s The Best Way To Make An Attack On Titan Game? Attack On Titan is, for the uninitiated, awesome. It’s a manga/anime series in which giant humanoid creatures, the eponymous titans, have appeared and driven humanity to near-extinction, retreating to a large city surrounded by giant walls too tall for the titans to scale. 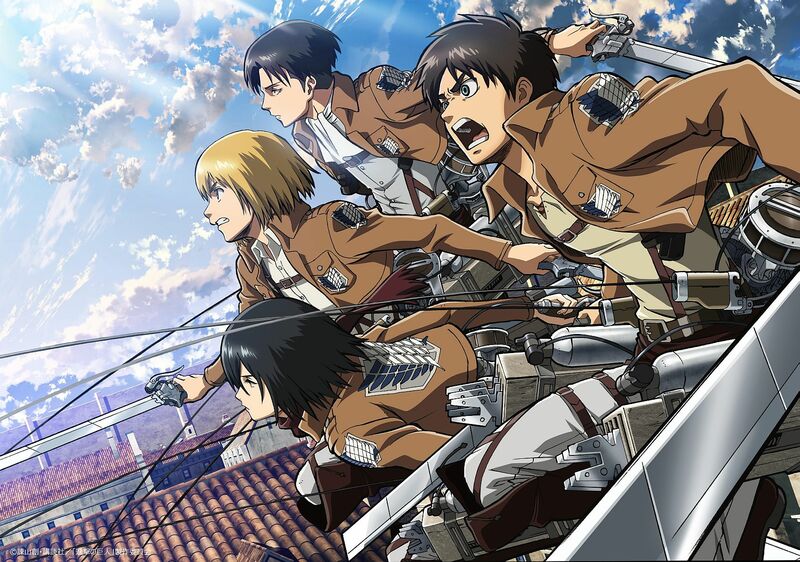 About 100 years since the occupation of the city, humanity’s military forces are divided into three main forces- the Garrison Corps who protect and maintain the city walls, the Military Police, the elitist force which protects the upper classes and monarchy, and the Survey Corps, who perform reconnaissance missions beyond the city’s walls to learn about and repel the titans. The story mainly follows the Survey Corps members, since they’re the guys who are most interesting and actually proactively try to fight the titans. Titans can only be killed through damage to the nape of the neck, and so soldiers have to utilise “3D manoeuvre gear”, essentially twin grappling hooks and boost packs which allow them to Spider-Man around the place so they can close in and slice at the titans’ necks from behind. It’s kind of hard to explain how awesome this is in action, but believe me: it’s awesome in action. So, here’s the question: what might be the best way to represent Attack on Titan in game form? The most obvious question is how best to represent the action; swinging about between buildings and through forests, avoiding being swatted away by your towering quarry and closing in on that all-important slash to the nape of the neck. The swinging mechanic is so indicative of Spider-man that we may as well draw our parallels from there. There are two potential swinging mechanics used in the Spider-man games; the Spider-Man (PS2) method, where you press a “swing” button and leap into action, and can be steered until you press the “swing” button again to stop. The problem with this method is that it’s too automatic and lacks a feeling of momentum. The Spider-man 2 method is more promising, in that you control the shot of each web as you swing. The problem with this is that manoeuvring yourself in order to circumnavigate and attack the specific weak point of the titan could be too fiddly when you have a greater degree of control over your movement. There could be a system where you can either go straight for the neck, or you go for weakness points like the knees to bring down your targets for easier dispatch, but overall it could be difficult to get the feel of movement right; the joy of swinging around New York in Spider-Man 2 was in the steady, hypnotic momentum, while AoT’s 3D manoeuvring gear should have a wilder, breakneck feel to it. Another issue with full control of your movement for AoT is that, by its nature, combat with titans is repetitive; you’re always dealing the death blow with a slash to the back of the neck. Furthermore, a great deal of the draw of AoT is in the human drama. Watching characters intelligently plan their way out of tight spots and react to the daily traumatic hell of their existence is the real heart of the story. That’s why I choose to put forward a different angle; Attack on Titan would be best represented, in my opinion, as an adventure game. Picture a Telltale- style game in which you are the squad leader of a Survey Corps team, sent out into titan-infested territory to carry out an intelligence mission. You’ve got to lead your team in an incredibly hostile environment, keeping as much of your group alive as possible while pursuing the mission. Much of the gameplay would revolve around making decisions on how to best proceed on the mission- do you take the risk of taking out a wandering titan, or try to sneak past? Perhaps it’d be best to get rid of the potential future threat, but it might use up too much of your precious 3D manoeuvre gear fuel, which could bite you in the tuchas later on. Of course, your actions will please some of your squad members and displease others, and the interpersonal tension could come into play later on. Of course, this kind of game lives and dies on the writing, since no narrative is engaging if the characters aren’t well written. Then, there’s the all-important titan fights. This style of game often favours the QTE-prompt, split-second-decision style of mechanic, which are very capable of engendering the kind of tension and desperation in Telltale’s Walking Dead games as well as recent release Until Dawn. This method would also allow for differentiating fights to a greater degree, since you can have each new threat occur in a completely different environmental situation without the fear of your action mechanics not quite working in that context. And so I put it to you that the ideal AoT game might be an adventure game. What do you think? Would you like to see a talented team take on AoT in the adventure game style, or is there an alternative that I haven’t thought of?